As you all know, I am a huge fan of children's and middle grade fiction! I've worked with kids from the time I was old enough not be considered one anymore, and I have a big love of the books that are written for them. That being said, I am extremely pleased to welcome Michelle Nicole Martin, author of Princess and Missy's Magical Adventures, to my blog for an interview today! Let's get into her head and bit and learn a little bit about her shall we? 1. Hello and welcome Michelle! Can you start off by telling us a little bit about yourself? 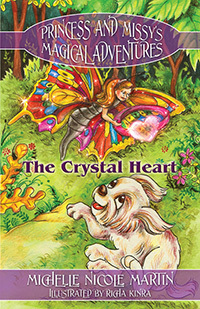 Princess and Missy's Magical Adventures is the first book that I self published. I have written many other books, but they are not published yet. I served in the U.S. Navy. I have had an assortment of careers, but I decided that I like writing over all of them. 2. What made you decide to start writing stories for children? I don't have any children, but I absolutely love them. I babysit for a lot of different friends. I love the innocence and excitement that children have. About four years ago, I read my manuscript to my best friend's son Zephan. He was enthusiastic when I read my story. He wanted me to keep reading. That encouraged me even more. The smile on his face lit up my world and I knew I wanted to write for children. Later, he started writing stories and I edited them for him. 3. Tell us a little bit about your main character. My main character Princess is partly real and fantasy. I once had a dog named Princess. She is my character in the book. One of my friends brought her to me. Princess was wandering in the streets in the rain. I tried finding her home, but I didn't have any success. SO, I adopted her and I thought up things she might say. I also made her a hero in the book. 4. That's so adorable! Can you give us a quick look inside the book? Princess is a poodle that looses her family. She becomes homeless. Even though she is in need, she saves children's lives. She is then rewarded by Missy, a magical butterfly. They go on adventures helping people. There is some fantasy and also some realistic events that take place. There are some lessons that show cildren as well as adults to never give up! When you carry on with your life and also help people when you can, wonderful possibilites occur! 5. What is up next for you? I have written the second and third series of Princess and Missy's Magical Adventures. I am working on some poetry for adults right now. I also have five picture books that were critiqued by children's author Lousie Munroy Foley. I have about another ten children's manuscripts that I haven't finished yet. I also have been working on an autobiography. I haven't decided if I ever want to publish that or not. Thank you so much for stopping by Michelle! If you are interested in finding out more about Michelle and her writing, here are some links to get you started. We all love links don't we? Michelle's Page at Outskirts Press / Michelle's Blog / Preview the book here!